This project aims to provide a better understanding of barriers to the adoption and implementation of natural flood management (NFM) in Scotland. NFM includes land use changes and agricultural measures which are designed to trap and store water in the landscape, and often entails farmers or other land-managers installing features or altering land management practices. It is crucial to understand land-manager decision-making and behaviour that affects the implementation in NFM: therefore, in 2011-2013 this project focused on the barriers to installing NFM features or measures at the farm level. The outputs from this phase of work are listed below. However, many other actors are also involved in enabling, promoting or influencing actions relevant to NFM, such as environmental statutory agencies and local authorities. Therefore, from 2014 - 2016 our work shifted to focus on the barriers experienced and perceived by other organisations or 'actors', in order to explore the institutional constraints that may affect ability to introduce new forms of flood management. This part of our work was informed by and related to theory and concepts on 'multi-level governance'. This five year project has now finished but this page will be kept updated with any outputs from the work as they are produced. Contact Kerry Waylen (Kerry.Waylen@hutton.ac.uk) to find out more about current projects on NFM and related topics. This project was funded by the Scottish Government RESAS Strategic Research Programme 2011-16. Holstead, K.L., Kenyon, W., Roulliand, J.J and Galan-Diaz, C. (2015). Natural flood management from the farmer's perspective: criteria that affect uptake, Journal of Flood Risk Management, 10(2): 2015-218. DOI: 10.1111/jfr3.12129. On 11th February 2016, we ran a workshop to discuss tackling the challenges to implementation of NFM, with representatives of a range of public, private and third-sector organisations connected with NFM and other aspects of catchment management in Scotland. Click here to download the report for that workshop [pdf, 1.54 MB] During that day we delivered a presentation on our findings summarising the barriers to NFM [pdf, 0.98MB]. This presentation represented an early stage of analysis that informed the 2017 academic paper listed above. Holstead, K.L., Waylen, K.A., Hopkins, J., Colley, K., 2015. 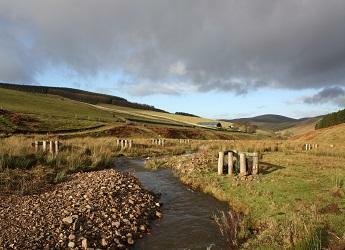 The challenges of doing something new: barriers to Natural Flood Management. Presentation at XVth IWRA World Water Congress, Edinburgh, 25-29th May 2015.